So since last Sunday's run through Ravello was such a boon, here are some shots I took of Positano. Positano is another little town along the Amalfi Coast and in a region of the world filled with so many one-of-a-kind places, Positano looms large despite its small size. 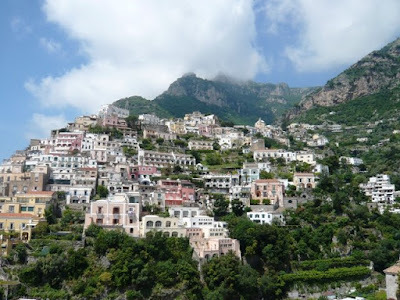 Positano is a town of about 4000 souls who cling to the cliffs that rise out of the Mediterranean. It's a town nearly devoid of roads, everything's connected by walkways and staircases instead. When it comes to photography, I'm usually the micro guy. I like to take photos of smaller details. 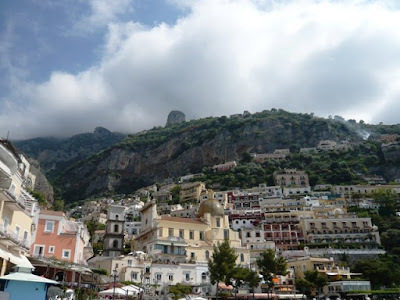 When I look back at my shots from Positano however, nearly all of them are panoramics and nearly all of them are shot looking up at the impossibility of the town. Here's Positano. Every one of those homes is connected to its neighbors and the town seems to creep up the cliffs. It's mind-bending. This is Pippo, the town dog. 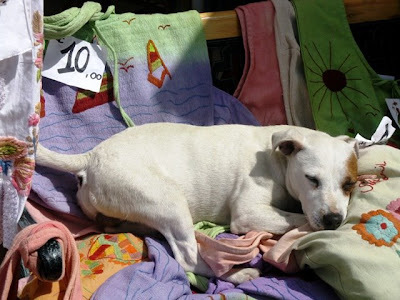 He's sleeping on a bench covered in beach towels and t-shirts that are for sale. If you want to buy something from this shop keeper you have to wake Pippo up and get him to move. Warning: he's pretty cranky when he first gets up. 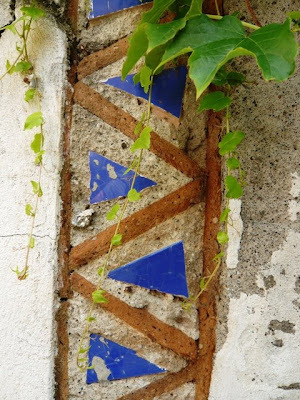 This region of Italy is renowned for its majolica tile and flourishes of it are everywhere. This shot is a detail of a garden wall and what a cool pattern this is. Another view looking up from the waterfront. One of Positano's few roads is in the foreground in this shot. 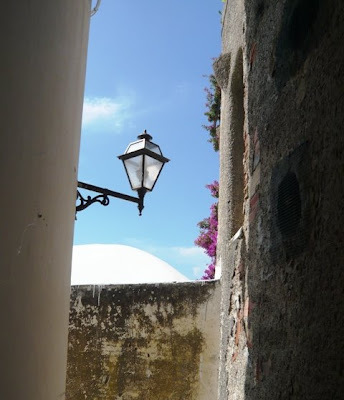 This narrow passageway is more typical means of getting around Positano. The sheer verticality of this town and the amount of stair climbing involved in getting from point A to point B keep the Positanans (and their visitors) in great shape. 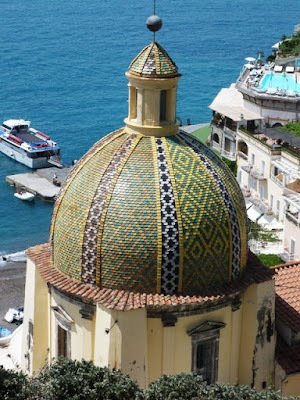 This is the 11th century cupola of the church of S. Maria Assunta. The exterior of that church looks the same today as it did when it was built nearly a thousand years ago. 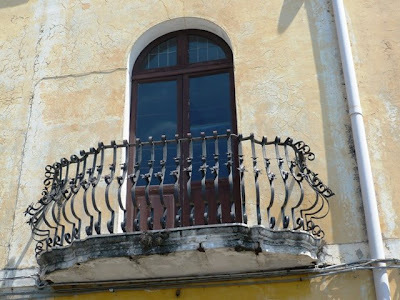 The iron work on this balcony impressed me and its state of near-decay makes it all the more interesting. 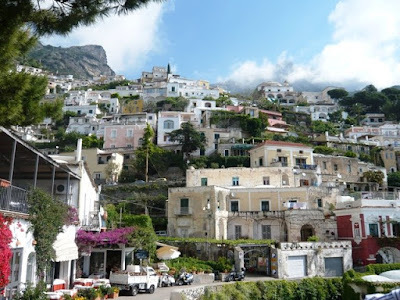 John Steinbeck wrote "Positano bites deep. It is a dream place that isn't quite real when you are there and becomes beckoningly real after you have gone." This is what I call my money shot. Of the thousands of photos I've taken over the years, this one stands out as my hands-down favorite. This copper statue was in an antique store and I borrowed it for a second, sat it on a wall and took the shot. It was a complete seat of the pants thing and for me, it sums up the incredible town of Positano perfectly. As in this photo, the place is a perfect mixture of art, mythology and scenery. I still can't believe I was there sometimes yet at the same time, it haunts me still. John Steinbeck was right. I don't think I'll ever be satisfied until I go back again. The Positanans have embraced the 20th century slowly and begrudgingly and I was surprised to see that they've set up a live webcam that looks down at their water front. 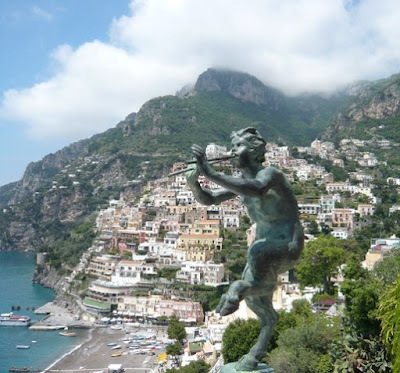 Clicking on the link to that Positano webcam has become my new mini-vacation. Check it out. Aw, that last shot was kismet. Just lovely, thank you. You're welcome Laurie, it was nice to relive some of that as I posted those photos. I think that you've captured the essence of Positano. I recognize many of the places where you took the photos as after twenty odd years of going there, they have become engrained in my memory. The narrow passage way, if I'm not mistaken is the one that leads to Fornillo beach just after the small church St. Margherita ? And there is another taken from La Grotta bus-stop, and then Palazzo Murat? bravo! You got the Palazzo Murat correct, La Grotta you pegged and so far as the passageway goes, you are probably correct there too. I remember walking down to Fornillo from the north side of Positano, and I am wracking my brain trying to remember what the church of S. Margherita looks like. Bell'avventura? Are you involved in Italy travel? My husband is from Positano and although we don't live there, we have the family home at which we try to spend as much time as possible. Fornillo is the area where we are based, that's why I recognize the nooks and crannies. You may not have seen the Church in Fornillo as it's barely more than a doorway in a small piazza from the outside. It's on the way down to Fornillo beach. You're very fortunate, what an amazing place to be able to spend time. I have an acquaintance who lives there, an American ex-pat. His stories, and now your blog, are the things I use as a retreat when I need to remember something peaceful and beautiful. 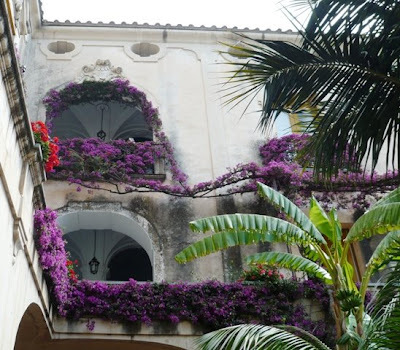 Peaceful, beautiful and filled with the quirks and irritations of southern Italy. big obvious question: why didn't you buy the statue? Steinbeck lived there with his wife for a time. He was embedded with the Allied Troops during the invasion of Italy in the waning years of WWII. His "Once There Was a War" is his collection of dispatches during his time there. His descriptions of Neapolitan culture are what first led me to that part of the world. He wrote with such bemused affection of the place there was no way I couldn't go.